It is 2017. You have done some research and decided to go ahead with Etsy's Promoted Listings. Open the sign-up page. Go ahead, push the orange button. There, you are advertising! Set an overall maximum bid right away. Push the "Advanced Settings" button. (Right below "advertise new listings automatically.") Set a maximum bid (called Max CPC). Setting an upper cap on the price you pay for ads can avoid some expensive browsing... You big spenders can set it as low as 1 cent. You can advertise specific items and not others by toggling the orange buttons on and off. Likely some items for sale need more exposure, while others do not. After the initial set up, now it is the time to adjust bid prices. If your shop is small, it is easy. If your shop is large, this may take some time. Or you can just leave everything at the same bid. When you set your low bid price for some items, you may see a little exclamation point. That indicates that the bid price virtually never reaches that (low) level. In that case, the item is unlikely to be seen for that bid, but it is not impossible. You will be pleased to note that your bid for the advertising space can be lower than your maximum bid. For example, I have some jewelry items where my bid was 5 cents, but they only charged me 1 cent for a view. That indicates that the bidding process is like eBay where you put your max but what you pay can be less. If I put a lower number than they suggest I still can get some placement. Perhaps not at the top of the first page, but increased visibility nevertheless. I am amazed that a competitive market like jewelry can have such a low bid price compared to post cards and photos. Odd. 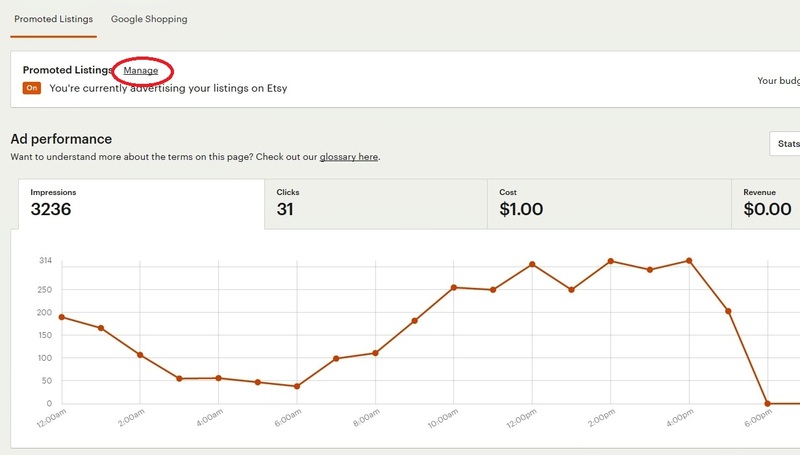 It has to be simply how much the sellers want to pay to advertise, how competitive Etsy's promoted listings are for that category, those keywords. After a few days, open your advertising dashboard. A link is in your shop drop-down menu. Your dashboard gives an overview of how the advertising campaign is going. 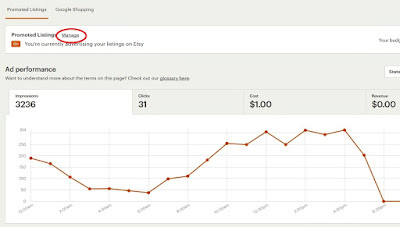 Impressions each hour or each day give you an idea of the ups and downs of Etsy searching. Are searches up or down during the Super Bowl? Advertising dashboard. Manage button circled in red. Has your campaign run out of money before the end of the day? Did you lift the cap, lower your bids, or just let it run out before 12 PM? Push your Manage Promoted Listings button as shown. A chart or table of your items can be seen with all sorts of interesting information. We will discuss that in a future installment. How can a tablet help my vintage Etsy business?